It's WINTER FUN, WESTERN STYLE! 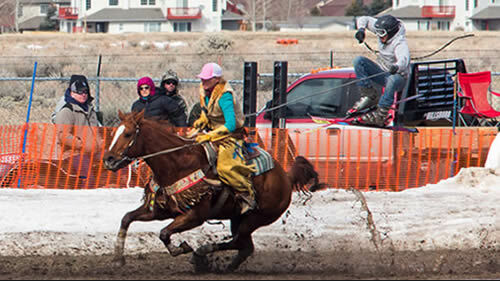 The Red Lodge Ski-Joring Association has been hosting the National Finals Ski-Joring Races since 1980. Ski-Joring originated in Scandinavian countries as a form of winter transportation. The west has transformed this into an action packed competition wherein teams of horse, rider and skier negotiate a 700+ foot course, the horse and rider taking a track to the inside of the course while the skier in tow, negotiates 20-some slalom gates and four jumps in hopes of completing two fast, clean runs. That isn’t so easy at speeds sometimes topping 25 mph.